Research & Development « Appealing Products, Inc. The NC Partnership for Defense Innovation held a competition to develop novel technology which can be used in both civilian and military applications. Appealing Products, Inc., (API), won first place in the competition out of the 24 companies that competed for the funds. API has developed a test system for studying the accumulation of ice on surfaces. The system allows for rapid, flexible testing of various surfaces and coatings in a wide range of icing conditions. API is always willing to pursue new research projects and development of new products. To discuss possible cooperation, please contact us. API has developed several products to assist in the quick and accurate detection of explosives and liquid explosive precursors. 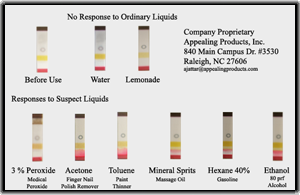 Verifier Tabs detect the presence of hydrocarbons, acetone, and peroxides in liquids in seconds. Gel-Ox indicators quickly detect the presence of peroxides in viscous materials such as gels. 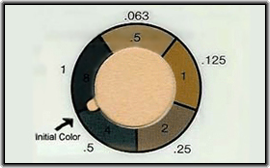 Our On-The-Spot nitrate detectors quickly indicate if nitrates such as traces of gun shot residue and explosives are present on a suspect surfaces, indicating their presence with color change. Keep up with our Detectors & Detection Kits for Explosives: ChemSee.com. API personnel have many years of experience in the development of toxic material detectors for gases and liquids. A full line of dosimeters and indicators for toxic gases, including nerve gas, mustard gas, and many common industrial chemicals such as formaldehyde, carbon monoxide, chlorine, and hydrogen sulfide has been developed. Keep up with our Toxic Gas Monitoring Solutions: ChemSee.com. API is currently developing ice-phobic coatings to prevent the condensation of ice upon surfaces. These nano-coatings will prevent costly build-up of ice on a variety of instruments and vehicles, helping reduce the cost of maintenance and repairs. API has a method for quick evaluation of the stability of the films on solid surfaces in icy conditions which allows rapid representative evaluation of coatings. API is currently developing new forensic methods to improve the accuracy, efficiency, and reliability of current methods. These include new products to detect the presence of gun shot residue (GSR) on suspect surfaces, such as the On-The-Spot nitrate detector now marketed on ChemSee’s website. 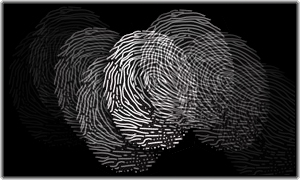 Other avenues of research include enhanced methods of fingerprint lifting, which would allow for more accurate collection of fingerprints from crime scenes. API will gladly assist any companies seeking assistance in the development of their product. Any interested party should fill out our consulting form, specifying their needs and desires for cooperation. Any party interested in becoming a distributor of API’s products should fill out our distributor application form. API has developed and is currently developing products which improve industrial hygeine and work in remedial situations after problems have occured. A full line of dosimeters for toxic industrial chemicals is available. Information is available on specific industrial needs by request at ChemSee.com. Decontamination of chemicals can be achieved using ChemSee decontamination products.